Layla Grayce is turning nine! 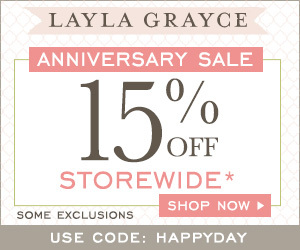 In celebration of their anniversary, Layla Grayce is offering a 15% off sitewide sale through 11/8 with promo code HAPPYDAY. Don't miss your chance to shop and save big on french & cottage furniture, nursery decor, gifts and more. This is an amazing offer - Happy Shopping! ALSO (if you miss the above promo) during the month of November, Layla Grayce is also featuring 10% off Bedhead Pajamas with code PJ10. Comfort and luxury fuse to create a line of spirited sleepwear featuring two-piece pajama sets, light camis, nightgowns and more.